CharterMason Drapac Development Team Set To Storm Tour of Tasmania. CharterMason Drapac Development Team (CMDDT) will seek to build on the two stage wins the team achieved at the recent Tour of the Murray as they travel south across Bass Straight for the 2013 Tour of Tasmania. While super sprinter and St Kilda CC member Shannon Johnson will take a well deserved rest (hello hills, goodbye sprinters! ), St Kilda CC will still be well represented with 2012 St Kilda CC club champion Andy Naylor joining the team as soigneur and Nick Bensley set to augment the regular riders of the CMDDT squad of Matthew Clark, Sam Crome, Nicholas Katsonis and Jason Spencer. 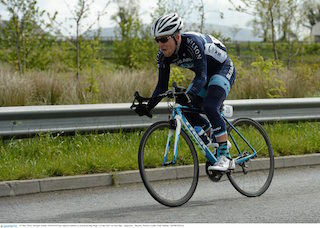 Joining the team again following a powerful performance at the Tour of Murray is Morgan Smith (NZ). Michael Torckler (NZ) joins the team fresh off winning the KOM jersey at the Tour of Utah in the USA, along with Taylor Gunman (NZ) who has come back from racing in Belgium to join the team for Tour of Tasmania.